2To make the crust, stir the graham crumbs, sugar and 1/4 cup melted butter until evenly combined and press into the bottom of an ungreased 9-inch spring form pan. Bake for 10 minutes, then cool. Brush the sides of the pan with a little melted butter. 3Increase the oven temperature to 400°F. Beat the cream cheese until light and fluffy. Add the 1 1/4 cups of sugar a little at a time, and scraping the sides and bottom of the bowl often. Beat in the cornstarch, vanilla and lemon zest. Beat in the eggs one at a time, on a lower speed, and scraping after each addition, then beat in the yolk. Still on low speed, beat in 3/4 cup of sour cream. Scrape this over the cooled crust. 4Bake the cheesecake for 10 minutes at 400°F and then reduce the oven temperature to 225°F and bake for 25 more minutes. Turn off the oven, and leave the cheesecake in for an hour, cracking the oven door after 30 minutes. 5While the cheesecake is baking, prepare the sour cream layer - stir the remaining 3/4 cup of sour cream with the remaining 2 Tbsp of sugar and the lemon juice. Spread this over the top of the cheesecake as soon as it has come out of the oven. Allow the cheesecake to cool completely to room temperature, then carefully run a spatula around the outside of the cheesecake to loosen it from the pan, then chill the cheesecake for at least 6 hours before slicing and serving. 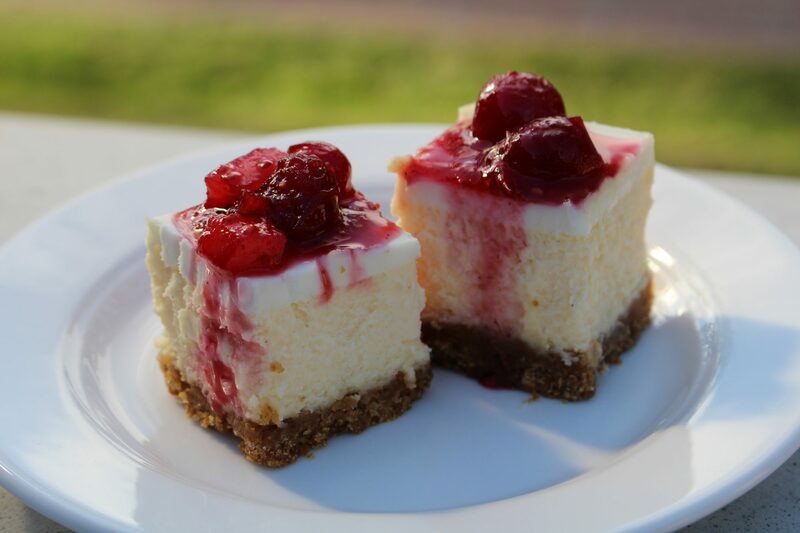 6 The cheesecake will keep, refrigerated, for up to 4 days.